Granite is an igneous rock of visible crystalline formation and texture. It is composed primarily of feldspar, quartz, and mica. It starts off as liquid magma deep within the earths core where it is cooled and compressed over millions of years under tons of pressure. It is then quarried, cut and polished. 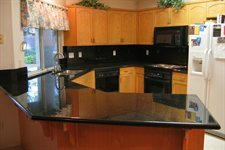 After that process it can be applied in various ways like kitchen countertops, vanity tops, fireplace surrounds as well as Jacuzzi surrounds and other custom designs.